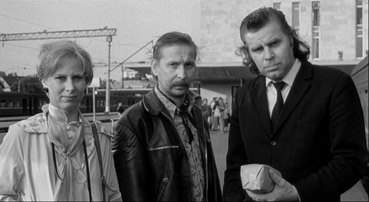 Volume 1 of Artificial Eye's welcome 3-disc sets of the films of Finnish director Aki Kaurismäki consisted of a trilogy linked by a common theme. Volume 2 takes a different tack. All three films star Kaurismäki favourite Kati Outinen and feature a sprinkling of other regulars in the support and co-starring roles, but their chief collective distinction appears to be their differences from each other. Included here are a black-and-white cultural road movie, the first part of a new trilogy, and a classically styled silent film. All three are distinctively Kaurismäki works and all three are really rather special. 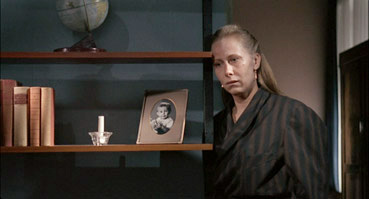 The enigmatically titled Take Care of Your Scarf, Tatjana [Pidä huivista kiinni, Tatjana] is Kaurismäki's take on the road movie. It represents something of a contradiction for non-Finnish viewers, being one of the director's most accessible films but also one whose subtleties are unlikely to be fully understood by a foreign audience, and I'm including myself in that sweeping suggestion. The journey begins when the hulking, coffee-addicted Valto (Mato Valtonen – imagine a Finnish Ron Perlman with a rock 'n' roll haircut), who appears to make a living sewing clothing for his intolerant mother, is informed that the house is devoid of his favourite brew. In a quiet rage he locks his mother in a closet, steals her money and hits the road with a portable coffee maker and his vodka-swilling auto-mechanic friend Reino (Matti Pellonpää). When they take a break they are eyed up by Russian Klavdia (Kirsi Tykkyläinen) and Estonian Tatjana (a perkier than usual Kati Outinen), two women looking to catch a ride from these "two dumb Finns." Despite the language barrier, the women attempt friendly communication with their hosts, only to have both men regress into a coffee and vodka-fueled state of sulking shyness. The two lead characters may be as forlorn as ever, but the underlying sadness and unbroken misfortune of the Underdog Trilogy is completely absent here, making it one of Kaurismäki's most openly humorous films. This doesn't mean it's crammed with funny one-liners and amusing pratfalls – the comedy comes totally from character moments, whether it be Valto's peculiar snoring, Reino casually wiping the oil dipstick on his companion's tie, or the hilarious 2-shot in which Reino gets stuck into a second vodka bottle while Valto stares ahead, jittering with the effects of a caffeine overload. The bulk of the humour stems from Valto and Reino's cheerless discomfort at their female companions, highlighted when the pair are reluctantly obliged to share hotel rooms with their guests – traditionally a moment for the breakdown of interpersonal barriers and the blossoming of romance, here it proves nothing of the sort, with Reino drinking himself into a stupor and Valto gruffly reluctant to even acknowledge Klavdia's presence. This communication gap is clearly about more than gender shyness and it's here that non-Finnish viewers are likely to miss out, as issues of culture and language and even history enter an equation that many of us do not have all the numbers needed to successfully calculate. But in a film this rich in character detail, this presents no real barrier to appreciation and enjoyment, and for me added an air of intrigue that prompted an immediate phone call my Finnish friends for their insights (which I'd be sharing right at this moment had they had actually been in). With the barrier between the sexes seemingly insurmountable, the gentle, hesitant hints of attraction that develop seem all the more touching, encapsulated in the quietest of moments, as when Tatjana rests her head on Reino's shoulder and he nervously puts his arm round her, or in the present that Klavdia later gives to Valto as she boards her train. The decision to shoot in black and white may well be one prompted by a fondness for road movies of years past (I was occasionally reminded of Wim Wenders' 1974 Alice in the Cities and 1976 Kings of the Road). It also shifts the narrative slightly out of the here and now, something whose relevance only really registers in the penultimate scene, an outrageous stop for coffee that at first seems like a flashback but proves most likely to be the product of Valto's fantasy. The implications of this are intriguing. As he returns home to unlock his mother and return to normality, we are left to wonder if, as in fellow minimalist Takeshi Kitano's 1990 3-4 x jûgatsu [Boiling Point], the entire journey was after all just one of the mind. Either way, Take Care of You Scarf, Tatjana is a low key delight and probably Kaurismäki's most upbeat (fictional) movie to date. It's winning example of the appeal of this particular director's style, and proof positive that unhappy people do not necessarily make for an unhappy film. Drifting Clouds (Kauas pilvet karkaavat) is the first film in what has been dubbed The Loser Trilogy, which continued in 2002 with Man Without a Past and concluded recently with Lights in the Dusk. It was originally intended as a follow-up to Shadows in Paradise, with the same characters played by the same two leads, but following the death of favourite actor Matti Pellonpää, the story and characters were re-written and a second trilogy of misfortune was born. The film is dedicated to Pellonpää's memory. I have a special relationship with Drifting Clouds, one I've already touched on in my coverage of Lights in the Dusk. It was the first Aki Kaurismäki film I saw and in my thirteen years of co-running a film society, was the film that pulled in the smallest audience we ever had. This should not in anyway be taken as an indication of the quality of the film, which was greatly admired by those who did attend – we screened it on a bitterly cold and windy winter's night at a cinema close to the seafront at the same time as a crucial football match was being shown on TV. The sports fans had offered apologies in advance, but the rest had taken one look at the weather and read the words "Finnish" and "downbeat" and decided that maybe an evening in front of the fire with a few glasses of wine might be altogether more agreeable. If you're working your way through Kaurismäki's filmography via Artificial Eye's three-film collections, then Drifting Clouds will seem both typical of its director and a slight break from tradition. The luckless couple at its centre are instantly recognisable, a happily married pair consisting of tram driver Lauri (Kari Väänänen) and head waiter Ilona (Kati Outinen), whose lives take a downward turn when they are both laid off from their respective jobs, Lauri due to personnel cutbacks, Ilona when the bank calls in loans that cannot be repaid, forcing the restaurant manager to sell up. There's an interesting imbalance to Kaurismäki's handling of the two events. Lauri's redundancy is partly the result of bad luck when he selects the lowest card in a job loss lottery and his reaction is restricted to a grumpy cinema visit and the unhappy revelation of the bad news to his wife. 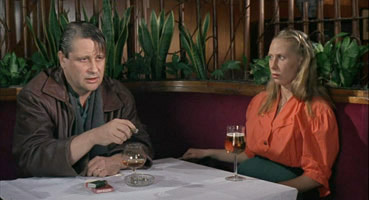 The restaurant's closing night, however, is awarded the sort of screen time rare for a Kaurismäki film, an extended sadness for the loss of an institution and the breakup of a working unit within, giving the scene the sort of emotional bite rare for one situated so early in a film. I began to suspect that there was an autobiographical element to this, though it is later revealed to have a narrative purpose, with the couple's future increasingly linked more to the fate of Ilona rather than that of her husband. As with the earlier Ariel, the drama has its foundation in social commentary, evident in both the effects of recessional economics on the lives of the Lauri and Ilona and the unprincipled opportunism it brings out in others, notably the one-man employment agency who demands 500 Markka to reveal the name and address of a potential employer, and the unpleasant bar owner who you just know is going to stitch Ilona up before the film is over. Later the restaurant's bulky doorman Marletin complains bitterly about the decline of Finnish society and its increasingly unsociable drinking habits, a small speech that can't help but sound like one from the director's own heart. Liani: It was nonsense. A comedy? Didn't laugh once. Ilona: It's not the cashier's fault. Liani: Got to vent my spleen, at least. Ilona: But she's your sister. Liani: More shame on her. It's also in this scene that you'll catch a rare Kaurismäki nod to other filmmakers, with posters for L'Agent, L'Atalante and Jim Jarmusch's Night on Earth, whose cast included Kaurismaäki regulars Matti Pellonpää and Sakan Kuosmanen, as well as the actor and assistant producer of this very film, Klaus Heydemann. Despite my usual aversion to movie formula, this is one time I found myself inwardly begging for things to work out for the couple in the end, and in partially playing to such expectations, Drifting Clouds manages a surprising but richly satisfying mix of social realism and Hollywood-style triumph in the face of adversity. But it's still every inch a Kaurismäki movie, from the run of painfully rotten luck that the hapless couple suffer to the stare-ahead deadpan exchanges and offbeat encounters, delicious moments that find comedy and humanity in the darkness. There's a logic to the idea that a director with a distinctly minimalist cinematic style should one day make a silent movie, stripping his drama of audible dialogue and telling his story purely with camera, expression and gesture. In common with many of its silent predecessors, Juha, which is based on the novel by respected Finnish writer Juhani Aho, is at its heart a morality tale of good tempted and corrupted by evil. Juha (Sakari Kuosmanen) is a farmer who lives a simple but fulfilling life with his younger but devoted wife Marja (Kati Outinen). This all changes when grizzled mobster Shemeikka's car breaks down and Juha offers to fix it. As soon as Shemeikka lays eyes on Marja he becomes determined to have her, but despite being fascinated by this stranger, she resists – she is, after all, a married woman. The next morning Shemeikka departs, but later returns with gifts for the couple and to step up his campaign to convince Marja to leave with him. Knowing nothing of Shemeikka's true nature and blinded by a romantic vision of what life with him would mean, Marja accepts. With Juha in a state of drunken unconsciousness, Marja packs her bags and heads off for a new life with a new man. 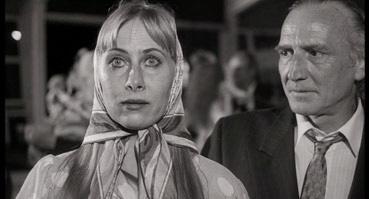 That things don't go well for Marja shouldn't surprise anyone – Kaurismäki regulars will be expecting this from the opening frame – but it also fits well with the tragic tone of classic silent melodrama, where the relationship problems of ordinary folk could be realised on an emotionally epic scale (see F.W. Murnau's 1927 Sunrise and King Vidor's 1928 The Crowd for examples of this at its best). Juha is left lonely and miserable, while Marja is mortified by the world she has fallen headlong into. Instead of an idyllic life with her man, she's given a bed in a crowded house and expected to share company with a group haggard gangsters' wives who look like they're on loan from David Lynch. From here on the narrative follows a straightforward and for the most part expected path, as Marja realises just what she has lost and Juha is taunted into vengeful action. In this the film is true to its influences, keeping its plot uncluttered, its morality uncomplicated and painting its characters in generally broad strokes. Emotions are inevitably exaggerated, but a neat balance is struck here between silent movie melodramatics and a toned-down modern naturalism, which helps steer the film clear of parody and enables us to care for characters that laughter might otherwise have kept at a distance. 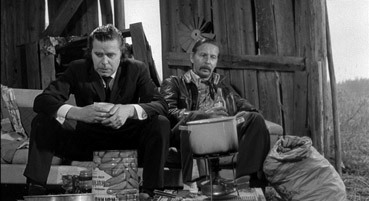 Gestures only become stylised in the final reel, with fights won with a grab of the lapels and a hard stare, and a particularly brutal act shown only briefly in shadow and then shielded from view by a closing door (the staging of violence just out of frame is a familiar Kaurismäki touch). It shouldn't really work, but it does and sublimely so. The performances hit just the right note, with Kati Outinen once again taking deserved centre stage, though as Shemeikka, André Wilms effectively suggests that beneath his seedy surface there lies a genuine and potentially dangerous threat. Gorgeously shot in black and white by Timo Salminen and boasting a rich and varied score by Anssi Tikanmäki that blends orchestral sweep with traditional folk tunes and rock 'n' roll, it captures the feel of the great silent movie dramas without faking an 'old film' look, presented with modern quality but as if the technology for synchronised sound and colour had simply never been developed. A final note for movie fans – watch out for the blackboard located behind the desk of the detective Juha visits. As with Volume 1, the transfer quality is consistently high, the anamorphic 1.85:1 transfers all displaying similarly impressive contrast and detail levels. The black and white beauty of Juha is particularly well captured, with excellent tonal range and coal-hole-at-night black levels. The Dolby 2.0 stereo tracks on Take Care of Your Scarf, Tatjana and Drifting Clouds are, as were the soundtracks on Volume 1, strikingly clear and well mixed. Juha has the option of a 5.1 surround track and this is the best of the lot, a full, rich soundtrack that really does justice to Anssi Tikanmäki's score. Once again, none, and once again a shame. The lack of extra features is particularly missed here, as some background on the language and cultural subtleties of Take Care of Your Scarf, Tatjana, the original intentions for Drifting Clouds and the thinking behind the silent movie approach to Juha would all have been welcomed. But as with Volume 1 it's the films that are the draw, and they alone are worth the purchase price, three more gems from the master of cinematic deadpan, very well presented for DVD. Roll on Volume 3!